Q. A question to you all. What are your feelings about this circuit, about Singapore? Your feelings about racing at night? Kimi RAIKKONEN: Last year was a nice race. We will see what we can do this year but hopefully for us it should be a little better than last year but we will see how it goes. Q . Kimi, you have spoken about not having any more modifications on the Ferrari. What are your expectations for this race? KR: I think we have a similar weekend than any other this year. It is very hard to say where we are before we even run. Circuits like Monaco and Valencia have been pretty okay for us, so maybe this is more like them. But I mean everybody seems to go forward and we have had no new parts since Hungary. All we have is small ones, but nothing major, but still we have been able to have good results, so hopefully it is the same here. Let's wait and see for tomorrow and then we will have a much better idea. Q. What did you take out of last year's race? It wasn't a good ending for you. KR: No, it wasn't. But that is what happens sometimes. It did not make much difference with my last year's position. I think overall the car suited this track very well. Usually it is a different car and different tyres we should be okay here and it is a nice circuit. They have changed it a little bit, but we will see how it is. Q. (Livio Oricchio – O Estado de Sao Paulo) To all drivers: Nelson Piquet crashed on purpose; do you think there is space for a driver like this in Formula One? KR: He admitted it himself but I think it will be difficult for him to get back after that kind of thing. It's not something I want to be involved in. If he comes back, it's going to be good for him, if not maybe there is a reason for it. Q. (Mark Fogarty – Auto Action) Lewis and Kimi, as the reigning and previous World Champions, do you not have an opinion on this race fixing scandal? Does it not outrage you, could you not fill us in on what you think about such a serious thing that has happened in your sport, particularly as you're representatives as World Champions? KR: It's not our team... Of course it's not a nice thing but I don't want to get involved in the whole situation. There's nothing that I can change there. You say some things and then people write it sometimes wrongly and you end up suddenly being part of it in the wrong way. We try to work in our team. It's not a nice thing for the sport but unfortunately some kind of scandal seems to happen every year. Hopefully it stops at some point and there's more about racing. Q. (Paulo Ianieri – La Gazzetta dello Sport) Since you're out there risking your lives, would you feel comfortable to be racing close to another guy who you knew has done something on purpose? He put himself in danger but he could also put you in danger. KR: Well, accidents can always happen, but I don't think there are many people who want to have accidents on purpose. It's a dangerous sport, anything can go wrong, even at slow speeds and you can get badly hurt but that's the risk we take. Q. 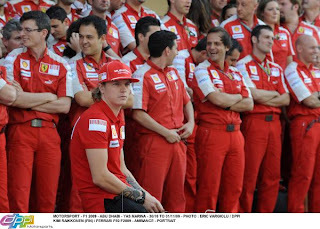 (Joris Fioriti – AFP) Kimi, what about you? Luca di Montezemolo said yesterday that it was between you and a Spanish guy. Everybody knows what he meant. It's getting closer and closer. KR: It's the same story still. I have a contract and I guess they want to talk about it, but it hasn't really changed anything since the last race or the race before.